Yesterday, I wrote about Diane Ravitch's important new book, Reign of Error: The Hoax of the Privatization Movement and the Danger to America's Public Schools. Today I'm doing so again, as I will likely do tomorrow. 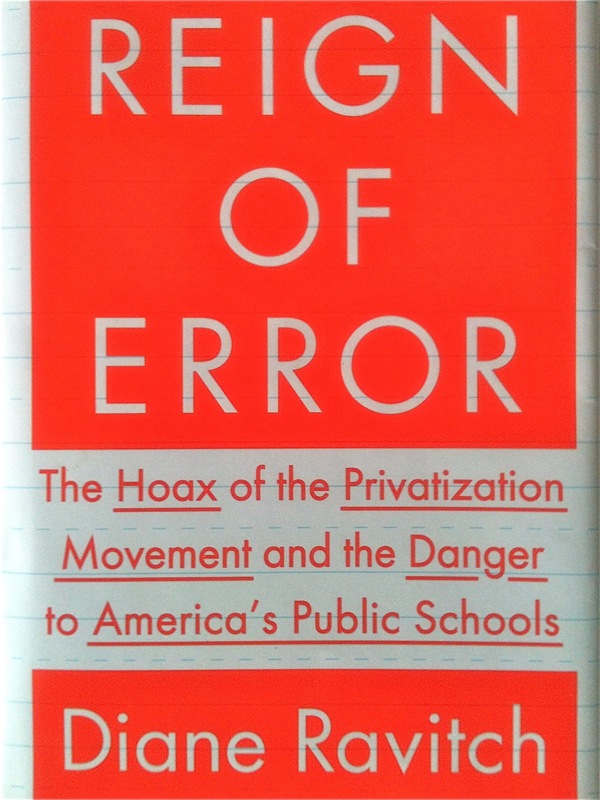 As I read Ravitch's surgeon-like dissection of the arguments made by those hell-bent upon privatizing our nation's public schools, I began to keep track of all the instances in which, when faced with stark evidence of failure, they have doubled down on their bad ideas, by writing the word, "Again!" in the margin. Flipping through the pages of my copy of the book it appears I've written it on almost every page. Let's take, as our for instance, the concept of merit pay for teachers, the idea of providing financial incentives to teachers in exchange for motivating their students to achieve higher standardized test scores: those whose students get higher test scores get a bonus, those whose don't get fired. Setting aside the question of whether or not high stakes standardized tests, as they are now being used, measure anything other than a student's socio-economic class (and that's a big set-aside), the idea is one that on the surface sounds worthy of more than a cursory look, right? Well, it has been looked at extensively, and found wanting, throughout the last century. Merit pay is not an innovative idea. It has been tried in school districts across the nation for the past century. Richard J. Murnane and David K. Chohen surveyed the history of merit pay in the mid-1980s and concluded that it "does not provide a solution to the problem of how to motivate teachers." In 1918, they reported, 48 percent of the school districts in the United States had some kind of merit pay plan, but few of them survived. By 1923, the proportion of districts with a merit pay plan had fallen to 33 percent, and in 1928 it was down to 18 percent. During the 1940s and 1950s, interest in merit pay declined, and by 1953 only 4 percent of cities with a population over thirty thousand offered merit pay. This could not have been because of the power of teachers' unions, because there were few unionized teachers at the time, and where unions existed, they were poorly organized and weak. After Sputnik in 1957, there was again a flurry of interest in merit pay, and 10 percent of districts offered it. But many of these programs disappeared, and by the mid-1980s, when Murnane and Cohen wrote their article, 99 percent of the nation's teachers were in districts that had a uniform salary schedule, based on education and experience. This is what we learn from both history as well as current research. A 2010 Vanderbilt University study of Nashville's merit pay system found no significant difference in the test scores of the students taught by teachers who received merit pay and those who didn't. New York City's experiment with merit pay, in which the city paid out $56 million in bonuses, was abandoned after three years during which test scores didn't budge. A Chicago merit pay system met a similar fate. As did one in Texas. And this is using their own flawed measuring stick -- high stakes standardized tests. (A)ll contemporary evidence on merit pay plans in American schools shows that they have had no effect on student test scores. The result, of course, is that New York is doubling down with a "new" plan modeled after the failed Nashville plan. The Texas legislature is also doubling down on their failure, expanding their pilot test statewide. In fact, right across the country school districts, urged on by corporate education reformers like Bill Gates and the Walton family (of Walmart fame), are doubling down on their past failures, coming up with yet another rehash of merit pay, convinced somehow that this time it will work, believing the same thing on Wednesday they believed on Monday, no matter what happened on Tuesday. They cry, We must get rid of unions! ignoring the fact that the states with strongest unions produce the highest test scores, while those with weak unions produce the lowest test scores. Yet again they double down, pushing in state after state for a weakening of teacher seniority and tenure with no evidence that this will do anything to improve educational outcomes. They insist that when it comes to teaching, experience doesn't matter, urging schools to rely on young, inexpensive, fresh-out-of-school temporary teachers trained in five weeks by organizations like Teach for America, ignoring the fact that teacher turnover has been shown time and again to depress achievement, especially in schools with more low-performing and black students. Yet again they double down, pushing in state after state to de-professionalize teaching, insisting that teachers don't really need much more skill than a line worker in a factory. They advocate for more and more high stakes standardized tests and curricula despite ample evidence that these are poor measures of actual learning, not to mention how they narrow our curricula to only those things that can be tested like math and literacy, pushing out the humanities, science, arts, civics, and physical education. Yet again they double down, pushing in state after state for more and more frequent testing as if they believe this time weighing the pig will fatten it. They demand more "choice" for parents, the traditional cry of segregationists, calling for charter and online schools, vouchers, and parent triggers, all of which have been found to, at best, produce results no better than public schools, and in many cases worse, often much worse. In state after state, these privatized replacements for public education have been riddled with corruption, fraud, nepotism, greed, and conflicts of interest, often pitting parents against one another, dividing communities where public schools once united us. Yet again they're doubling down. Their belief in the magical power of money is unbounded. Their belief in the importance of evidence is not. We are being hoodwinked by "free market" ideologues, people of faith that put most religious people to shame. It is a faith based upon the mental experiments of people like Milton Friedman and Ayn Rand, apostles of selfishness, competition, and the spread sheet mentality. There is nothing in these people's world that cannot be improved by the application corporate "values." You know, the values exhibited by the Wall Street hedge fund managers who, of course, are part of the neoliberal chorus in support these evidence-free "reforms." This is why they simply cannot accept the evidence before their eyes: like all fundamentalists they are incapable of seeing anything that doesn't exist within their carefully constructed belief system. They believe the same thing on Wednesday that they believed on Monday, no matter what happened on Tuesday. This is why they must lie, insisting that our schools are failing when they are not; that our test scores are too low when they are the highest they've ever been; that our achievement gaps are growing when they are, in fact, shrinking; that we are falling behind other nations when we are not; that there are too many dropouts when our graduation rate is at an all-time high. Heck, corporate reform poster child Michelle Rhee's entire "career" is based upon lies. This is why they cannot answer us when we point these things out, choosing instead to try to deflect our reasoned response by accusing us of being racists or union thugs or communists or, as Bill Gates once described Ravitch, "my enemy." The goal is nothing less than the destruction of public education, because its continued success -- and it must succeed if democracy is to succeed -- stands as a refutation of their faith. These are my words, not Ravich's, who writes, commendably, with a much steadier temperament, although as a reader, I can feel fire just beneath the surface. The facts are not on their side and deep down they must know it. It's hard living with this level of cognitive dissonance, especially when you have billions of dollars and can usually buy whatever you want. And ultimately that is why they are so dangerous: sometimes you don't need evidence when you have money. It can pay for people to forget what happened on Tuesday. But, I'm afraid they underestimate us. We are parents and teachers. We're fighting for our children. What happened on Tuesday matters. Diane Ravitch is the voice of Tuesday. "When She's Nice To Me, I Play With Her."